Coll. No. 1209, 13 Jul 2015, characters observed: Perennial herb, to 40 cm. ; Stem, curved multicellular hairs, glands; Leaves, cauline, alternate, 13 mm. × 4 mm. 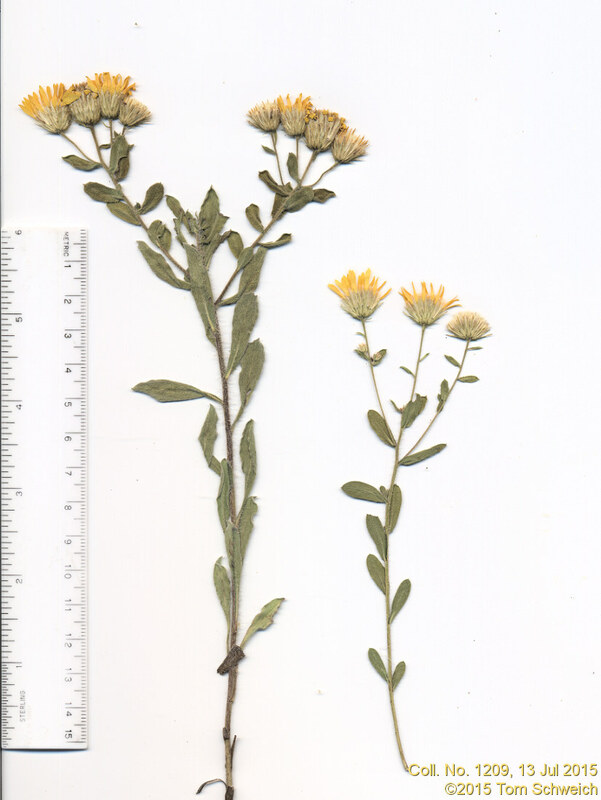 wide, oblong to oblanceolate, margin entire (some contorted after drying), tip small pointed, curved hairs, yellow glandular; Inflorescence, 1-7 heads per stem, single heads on short pedicels, flowers of 2 kinds; Bracts, unremarkable; Phyllaries, in 2+ graduated series, 2-7 mm. × <1 mm. wide, lance-linear, tips erect, hairy, glandular; Receptacle epaleate, hemispheric; Rays, sterile, corolla, 10 mm. × 1.3 mm. wide, yellow; Disk flowers, corolla, 5.0 mm., yellow; Pappus, outer of short scales and inner of long bristles (easier seen in mature fruit, in flower will appear as one series of long and short bristles), longest 5.5-6.0 mm., ≥disk flowers, short plumose; cypsela, 2.6 mm. × 1.2 mm. wide, hairy.